This name uses Spanish naming customs: the first or paternal family name is Arredondo and the second or maternal family name is Moreno. Julián David Arredondo Moreno (born 30 July 1988) is a professional Colombian road cyclist, currently riding for UCI ProTeam Trek–Segafredo. 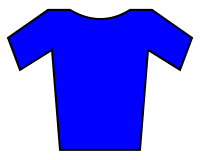 Arredondo is best known for winning the mountains classification at the 2014 Giro d'Italia, as well as the 2012–13 UCI Asia Tour standings. 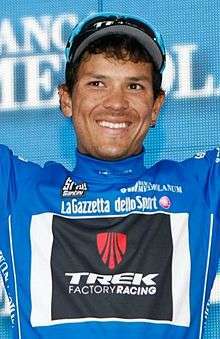 Arredondo left Team Nippo–De Rosa at the end of the 2013 season, and joined Trek Factory Racing for the 2014 season. He was named in the start list for the 2015 Tour de France. 1 2 Rivera Angel, Fredy (23 August 2013). "Otro escarabajo en el WT, el Trek fichó al Colombiano Julian David Arredondo para el 2014" [Another beetle in the WT, TREK signed the Colombian Julian David Arredondo for 2014]. 6cero (in Spanish). Diario Deportivo Digital S.L. Retrieved 28 August 2013.